Richard Eisen (/ˈaɪzən/; born June 24, 1969) is an American television journalist for the NFL Network, CBS Sports and NBC Sports and a TV/radio host for DirecTV and FOX Sports Radio. Eisen was born in Brooklyn, New York, and was raised on Staten Island. Eisen attended the University of Michigan, where he served as co–sports editor of the school's Michigan Daily and member of the Pi Kappa Phi fraternity. He graduated in 1990 with a bachelor of arts degree, and in 1994 he earned a master of science degree in journalism from the Medill School of Journalism at Northwestern University. Eisen was first a staff writer for the Staten Island Advance from 1990–1993, and the Chicago Tribune in 1993 and 1994. He was then a sports anchor and reporter at KRCR-TV in Redding, California from 1994 to 1996, and also worked in television as the Medill News Service's Washington correspondent (1994). Before working for the NFL Network, he worked for ESPN. He was part of a duo with Stuart Scott, and became well known for his humor, most notably his impressions of Atlanta Braves broadcaster Skip Caray and provided interviews during the Home Run Derby. Eisen was also the host of ESPN's reality series, Beg, Borrow & Deal. For ESPN Radio, he served as host of Major League Baseball and as a guest host on The Tony Kornheiser Show and The Dan Patrick Show. Outside of the world of sports, Eisen hosted the ABC show Domino Day. Among Eisen's notable achievements while at ESPN, was breaking the news of St. Louis slugger Mark McGwire's retirement from baseball in 2001 on SportsCenter. Days later, he sat down with McGwire for an exclusive interview elaborating on the decision. 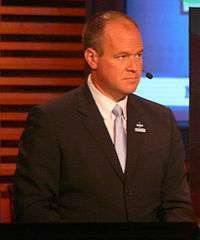 Rich Eisen was the first on-air talent added to the NFL Network roster in June 2003. Eisen is the face of the 24-hour, seven-day-a-week cable and satellite channel dedicated to football that debuted in November 2003. 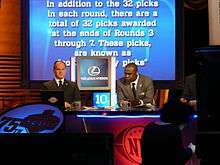 He was the main host of the show, NFL Total Access, the network flagship program, until August 2011. Eisen signed a new long-term deal with NFL Network in 2010 and became the new host of NFL GameDay Morning, the first pregame show on the NFL Network. Eisen also remains host of NFL Total Access and NFL GameDay Highlights, as well as NFL Network’s Thursday Night Football pregame, halftime and postgame shows and special on-location coverage from league events such as Kickoff, Pro Football Hall of Fame, NFL Scouting Combine, NFL Draft and Super Bowl. Eisen expanded his resume in 2010 with the debut of "The Rich Eisen Podcast," the first-ever podcast for NFL.com. The weekly podcast, available on NFL.com and iTunes, features guests from the world of sports and entertainment news talking football and all the latest headlines. Since its debut, the podcast has been downloaded more than 7 million times and recently celebrated its 200th episode in 2013. In November 2012, Eisen's first Thanksgiving Special aired on the NFL Network with a variety of celebrity guests talking mostly sports and current events. That makes his best time 5.94, in 2016. Eisen worked as a play-by-play announcer for CBS Sports coverage of the U.S. Open Tennis Championships, in addition to serving as the anchor for the network's weeknight (and late-night) highlights show during the tournament. On November 3, 2014, Eisen took over the noon-3 p.m. time slot on Fox Sports Radio from Jay Mohr, who moved to the 3-6 p.m. slot. Eisen was the host of the TNT original reality series, The Great Escape, which debuted on June 24, 2012 and was cancelled in October 2012. On October 6, 2014, Eisen began a new sportstalk TV/radio show, The Rich Eisen Show. The show is broadcast live from DirecTV's El Segundo, California Studios on Audience Network and NFL Now. On November 3, 2014 the show was picked up by Fox Sports Radio and broadcast daily from noon-3 p.m. ET. In March 2016 Eisen was a sideline reporter for NCAA March Madness (CBS/Turner). Since 2015, Eisen has had a recurring role as himself on the CBS sitcom The Odd Couple, playing the arch rival of fictional sports radio personality Oscar Madison (Matthew Perry). In 2003, Eisen married Suzy Shuster, currently a college football sideline reporter for ESPN on ABC. They have two sons and a daughter, and live near Coldwater Canyon in Beverly Hills, California. Eisen wrote the book Total Access, which was published in 2007. In 2012, he started the Punters Are People Too movement after Bryan Anger was drafted by the Jacksonville Jaguars in the third round of the 2012 NFL Draft. In 2014, he had a small cameo in the film Draft Day. 1 2 Rich Eisen Biography. Retrieved on November 6, 2007. ↑ "Rich Eisen (Alpha Kappa - Michigan) - Former ESPN Anchor "publisher=Pi Kappa Phi". Retrieved September 24, 2012. ↑ "Running in a suit". USA Today. ↑ "TNT orders first reality competition show". UPI.com. United Press International. January 6, 2012. Retrieved March 15, 2012. ↑ "Rich Eisen is getting a three-hour daily NFL talk show on DirecTV". usatoday.com. USA Today. August 18, 2014. Retrieved August 18, 2014. ↑ "Series Premiere of 'The Rich Eisen Show' to Air Today on DIRECTV and NFL Now". nfl.com. NFL Communications. October 6, 2014. Retrieved October 6, 2014. ↑ "FOX Sports Radio & DIRECTV to Bring THE RICH EISEN SHOW to Sports Radio Fans Nationwide". broadwayworld.com. BMW TV World. October 7, 2014. Retrieved October 7, 2014.